Everybody is in favor of high-quality clinical trials. But what does that mean, exactly? The clinical trials enterprise has long assumed that when it comes to ensuring trial quality, data is king and more is better. Not only was it considered essential to gather detailed data on every aspect of a clinical trial, but that data had to be double-entered, checked, queried, cleaned, and validated. In fact, this “kitchen sink” concept, commonly known as “100 percent source data verification,”1 became so ingrained that it was considered risky not to collect ever-increasing volumes of data and metadata. However, growing evidence suggests that a myopic focus on the accuracy of each data point, regardless of its criticality, adds little — if anything — to trial quality and safety, while incurring significant expense and effort. This has prompted interest in more tailored approaches that are informed both by trial design and how trial conduct influences quality. Such approaches can help ease unnecessary burdens for trial participation and conduct and, therefore, improve the efficiency of drug development and ultimately bring new products to patients more quickly. If setting a rigid goal of an absolutely flawless study turns out to be neither realistic nor desirable, how can we ensure that clinical trials are fine-tuned to provide trustworthy answers to clinical questions and protect patient safety? The answer lies in how we define quality itself in the context of research. The concept of quality by design (QbD) was first described by engineer and management consultant Joseph M. Juran in the early 1990s. Put simply, it defines quality as freedom from errors that matter. For a clinical trial, this could mean errors in study conduct or inaccuracies in data collection and reporting that affect the prespecified study endpoints (and therefore harm study validity) or that jeopardize a patient’s rights or safety. By clearing away the “underbrush” of less important considerations and focusing on essential elements, trials can be designed to yield more reliable data about the outcomes of interest – and to do so more efficiently and at lower cost. 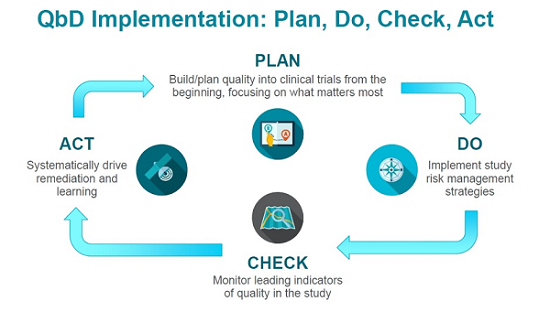 The Clinical Trials Transformation Initiative (CTTI) has extended the QbD construct into a fully actionable package for clinical trial development and conduct that includes a set of core recommendations and a practical toolkit for planning and implementing a successful QbD framework. Below, we’ll take a look at some elements of QbD in more detail. CTTI’s approach to QbD starts at the point of protocol conception and design and continues throughout the study’s life cycle. By applying a framework known as Plan, Do, Check, Act, the entire process of study development and implementation becomes a cycle of continuous learning and improvement. Plan. As we noted above, building quality into a clinical trial starts early.3,4 As a protocol is developed, experts and stakeholders can identify aspects that are most important to the study’s integrity, safety, and successful execution. Those elements (and data associated with them) are prioritized, while ones that don’t serve an essential purpose are discarded. Or to put it another way: just because you can put it into a protocol doesn’t mean you should. Prospective planning, informed by meaningful engagement with all stakeholders, is critical at this stage. Do. Once the approach to ensuring quality and managing risk has been designed, it must be implemented. Research site staff must understand protocol procedures and be able to successfully execute the study. This includes having adequate numbers of experienced, well-trained personnel and the infrastructure needed to support study personnel in conducting the trial. Check. Once a study is implemented, it is not enough to simply set a quality/risk management plan in motion. As work progresses, it is essential to continually check the map against the actual territory. Critical quality indicators should be periodically reviewed and evaluated for their fitness-for-purpose, and adjustments should be made as needed. Act. Finally, the information gathered during a study — from protocol design to study closeout — should be used to refine approaches and distill and disseminate actionable lessons, and relevant lessons should be reviewed during the development of new protocols. This final stage of the QbD construct creates a positive feedback loop that can drive continuous improvement across multiple trials. Implementing QbD can sometimes be an uphill battle. In our experience, significant roadblocks can emerge at the outset when justifying the additional time and effort needed for successful implementation. The single biggest challenge to employing QbD may be overcoming institutionalized reluctance to use a more targeted quality assurance/risk management approach. For these reasons, it is critical to adapt QbD principles in ways that match the needs of the particular trial and its stakeholders. In addition, for study sponsors, there should be an organizational commitment to and investment in QbD that is reflected in both infrastructure and process. Resources such as CTTI’s QbD Toolkit may prove useful for overcoming hurdles. The capacity to analyze and visualize data that will allow a study team to assess progress, identify gaps or shortcomings, and compare outcomes is also essential to success. CTTI is currently working to develop additional resources that can support adopters as they move from theory and concept to implementation. These efforts include the creation of a how-to guide for implementing QbD in clinical trials. Remember: QbD is not one-size-fits-all. Rather, it is a way of approaching trial design and implementation that ensures that each individual trial is more efficient, more reliable, and — ultimately — more impactful. Sprenger S, Nickerson D, Meeker-O’Connell A, Morrison B. Quality by Design in clinical trials: A collaborative pilot with the FDA. Ther Innov Regul Sci. 2012;47(2):161-6. Meeker-O’Connell A, Glessner C, Behm M, et al. Enhancing clinical evidence by proactively building quality into clinical trials. Clin Trials. 2016;13(4):439-444. Julie Dietrich is a former director of clinical development in Amgen’s Center for Design & Analysis, where she partnered with product teams to design optimized clinical programs and implement innovative solutions. She also headed the Patient Experience Program for Amgen’s Clinical Technology & Experience Lab, where they partner with patients to co-design and leverage digital health technology to transform the clinical trial experience. Dietrich led company-wide initiatives related to patient centricity and evidence generation planning and is committed to advancing ideas for how to collaborate with patients throughout drug development. Annemarie Forrest is the associate director of projects at the Clinical Trials Transformation Initiative (CTTI), where she provides senior operational leadership for core activities such as project management, site management, personnel management, financial performance, regulatory compliance, information systems, and process improvement. She previously served as director of field clinical operations for CoAxia, as a clinical research associate for Westat, and as a research nurse specialist at the National Institute of Neurological Disorders and Stroke (NINDS). Ann Meeker-O’Connell is VP, global head, quality assurance at IQVIA. She previously served as bioresearch quality and compliance for the Johnson & Johnson Family of Consumer Companies, and as acting director of the Division of Good Clinical Practice Compliance at the FDA. During her tenure there, she championed and led agency initiatives related to innovative models for clinical trial conduct and oversight. She served as a team leader for the CTTI quality by design project.